Work-life balance is easy when you are doing something you are passionate about. Entrepreneurship can fall into this category. When your passion is helping entrepreneurs, no one thinks twice today, but what about 20 years ago? Shari Ressler did just that. While others were cashing out, she kept grinding away at building a successful law practice to help entrepreneurs. This passion and drive lead her to start a conversation in a tech city to help non-tech companies. With SKU, their Consumer Products Goods focus has created a niche accelerator that is growing year over year (with exciting things ahead). Her Berkley flower child mentality has driven her to learn constantly and love everyone. In her words, “ohming” all day doesn’t get you what you want, sometimes you have to push yourself and take actions. She believes in creating connections for success and building a strong community. The legal side to any startup can cause a headache or two. From deciding which entity to form, all the way down to receiving your official paperwork. Most of the work is turn key for a legal professional but still a time-consuming process. Counsl is looking to streamline the process thereby increasing margins for a law firm and give ease of access to important information a business owners need. Law firms can white label the app for ease of communication with clients and document storage. Everyone spends less time working on basic legal needs and more time building a relationship to help grow a business. Man’s best friend is going tech. Dogs hold a special place in an owner’s heart and wallets. The pet industry is always growing and looking for ways to create a deeper bond with pets. Peppypets is looking to offer all of these components. More than an activity tracker (think Fitbit for dogs), it’s a discovery tool for breed information, events in the community, and other important information to keep your dog safe and healthy. Gain insights into providing a happy environment for Fido. The technology is a single collar unit and has a year lifespan before being replaced. Small businesses are big business when it comes to employment, job creators, and the shear amount of them in the US and around the world. From the startup tech company down to the artist working out of their garage, small business owners typically go into business to chase a passion. Those passions are great motivators and then the ‘business’ side of being a boss kicks in. Paperwork, financing, client information all has to be taken care of as well. My Business Genie focuses on helping business owners spend less time on the business side and more time doing what they love. Streamline proposals, new client onboarding, client communications, and more. My Business Genie brings you a personal assistant/office manager helping you grow your business. With over 2000 food trucks in Austin, which one do you choose and where do you go to check their location? Some have stationary locations, others travel at random or on a schedule. Also with that many options, what are you hungry for? Fuddar is two-fold – for the Truck Owner and the Hungry Customer. Customers have the ability to locate food trucks, search by category, and learn more about a food truck within the app. The real-time information will allow the customer to know it’s going to be at the location. Truck owners have a platform for helping to promote their truck and find new spaces in the area to set-up. The app gives an enhancement to social media marketing which most trucks are already utilizing. 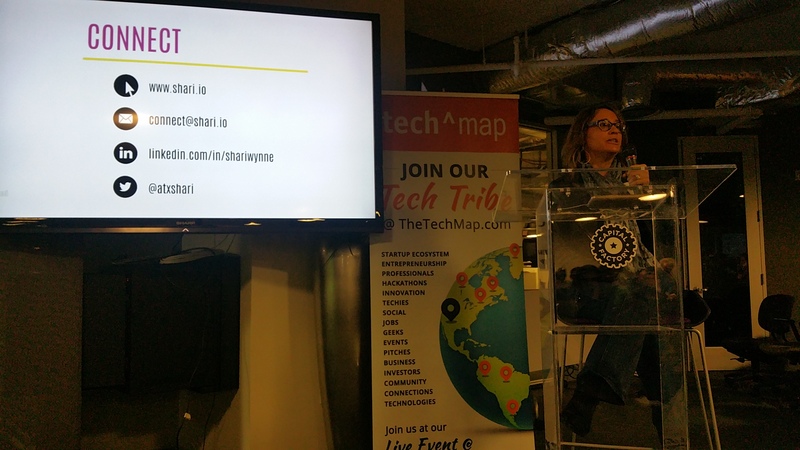 2015 for The Tech Map and the Co-Founder meetup has been amazing! Thank you to everyone who makes this event a success here in Austin. From sponsors, pitches, and now keynote presenters; it takes a community to grow as an individual and Austin is passionate about helping each other out. We are looking forward to continued success and growth in 2016! Next Which App is Draining Your Android Battery?